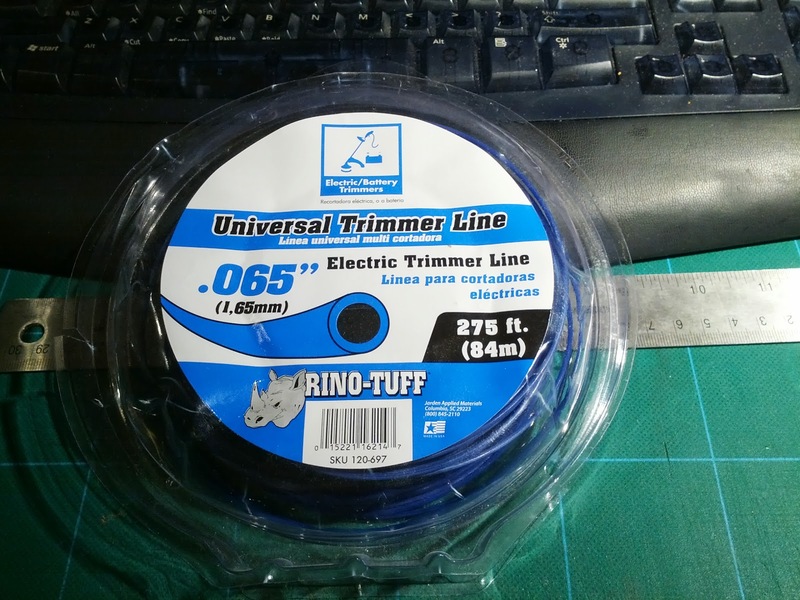 So awhile back I read an article about using trimmer line, or as its commonly knows as "weed wacker line", as filament in a 3d printer. Some people have suggested that its nylon, but some others say it may contain other things as well and could be of issue when used in 3d printers. I did a cursory search for the msds but didn't fine anything worth while. So, I went to homedepot and picked up a few rolls of various colors and sizes from pretty much the only the one brand they had Rino. 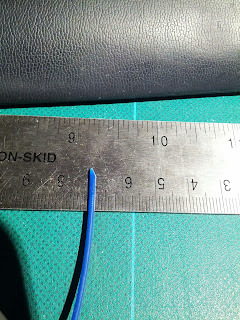 After getting them all home I came to realize that only one of the filament would fit into my 3dprinter that uses 1.75 mm filament which is the "blue" universal trimmer line which is 1.65 mm. It cost $7.98. 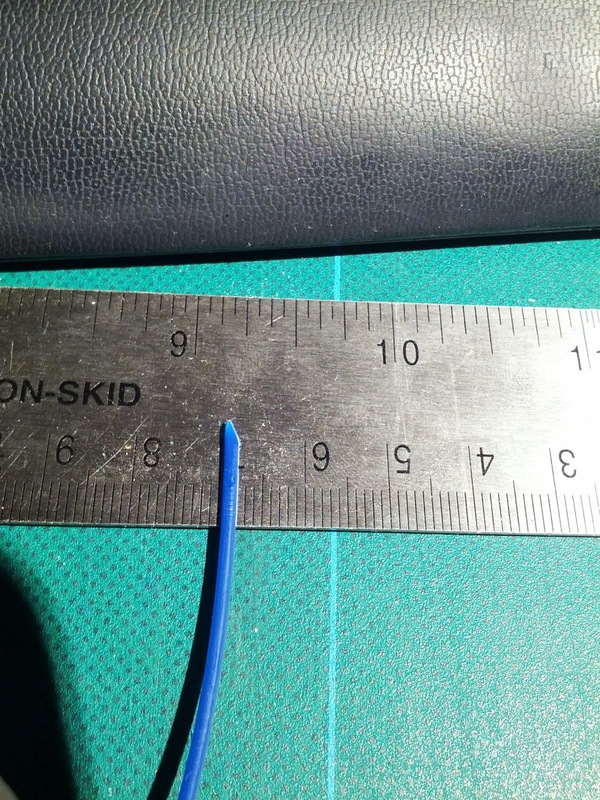 There was a green trimmer line that measured 2.0 mm but just wouldn't fit into the printers hot end. I'm guessing you need filament that is 1.95 mm or smaller for use in the 3d printers that require 1.75 mm. Back to the store and returned all of the other filament the next day since I hadn't opened the rest of the trimmer line packages. The focus of my tests would be with the blue 1.65 trimmer line. When printing, I used both blue tape and cereal box cardboard as a printing surface. 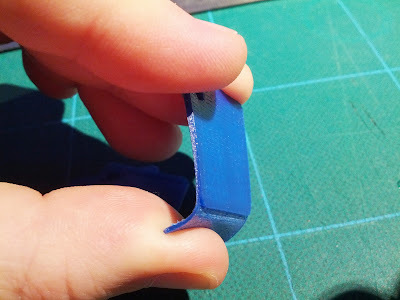 The more celouse the base the better "stick" you'll get but blue painter's tape seems to be the best of both "stick to hold" onto the print bed and the ability to "release" the print afterward. The cereal box (non shiny side) really held on to the print and even tore away at the cereal box more than anything after printing. 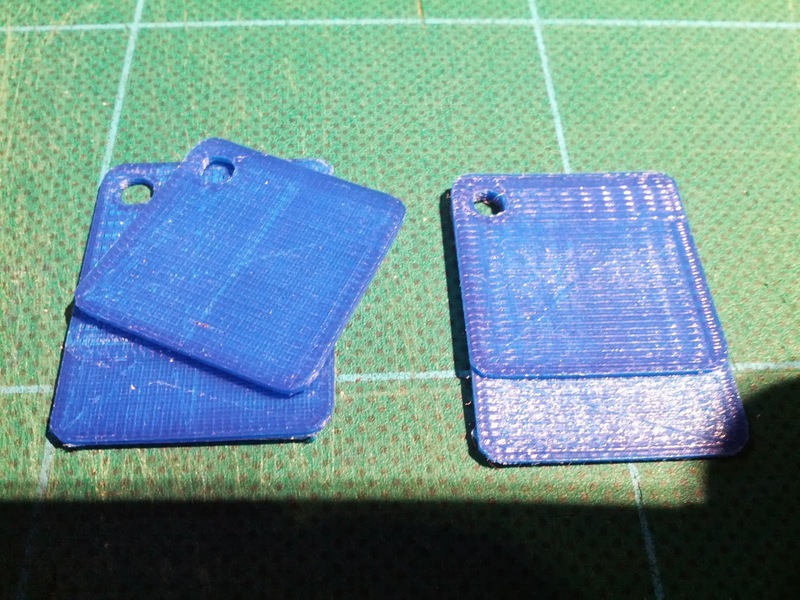 So i'd recommend using blue painters tape for a print bed surface. So what are my findings? 235c seems to be the best temp for printing this particular brand of line trimmer. Also having a heated print bed is beneficial, but regardless I was getting a lot of warp in tall prints and ultimately the print head would hit a print and then all hell would break loose and i'd have to cancel the print. In general the price is about the same, depending on where you get it, as if your were to buy the taulman's 618 or 645 nylon filament. Maybe a penny or two more for the trimmer line. However where you get nice smooth prints with the taulman, the trimmer line isn't really feasible for anything other than small items i think, very small as in maybe 2 in x 2in. But in pinch if you need something smallish and is more of a prototype and not need a finished product the trimmer line will indeed work. I'd just recommend printing at 235c or higher, and adjust your printer head speed depending on your object as well as resolution of the object. 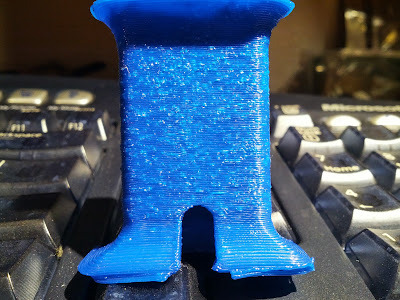 300 microns and faster print speeds seems to have more "bubbles" developing, where as higher 100 microns and slower print head speeds leads to less but is prone to possible melting spots/burn spots if you print too high of temp. 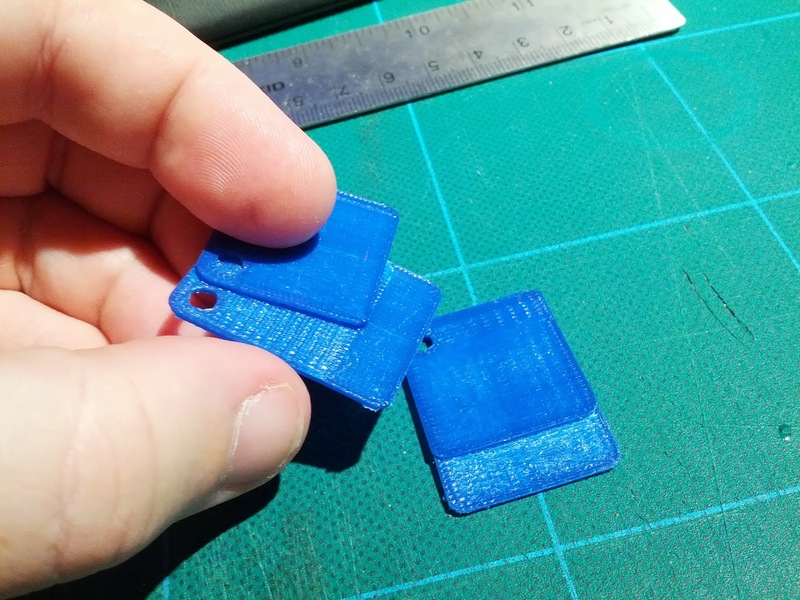 Here I printed two "sample chips" here you can see what happens when you print at a lower temp of 225c, you get de-lamination of the layers, the little top square came right off when i bent the chip as can be seen below. 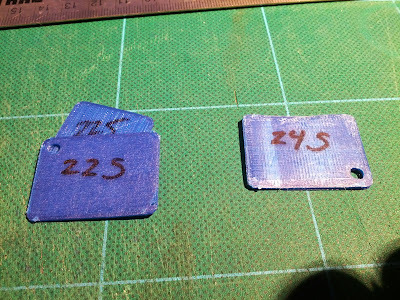 I printed the sample chips at 225c(low end) and 245c(high end) the "chalkiness" of the 245c was my attempt to do some sanding of the *nylon chip (*not sure if its nylon or nylon+other junk) but i'm not sure if nylon is even sand-able so there is that. Here you can see how I was stressing out the chips to see what is their breaking point. This is the chip printed at 245c. The layers all bound together and no de-lamination occurred. Very strong piece and semi-flexible. Did the same stress test with the chip printed at 225c and when I bent the chip as I did the 245c chip the smaller square de-laminated right at the layer where the larger square and smaller square connected. Pop'd right off. 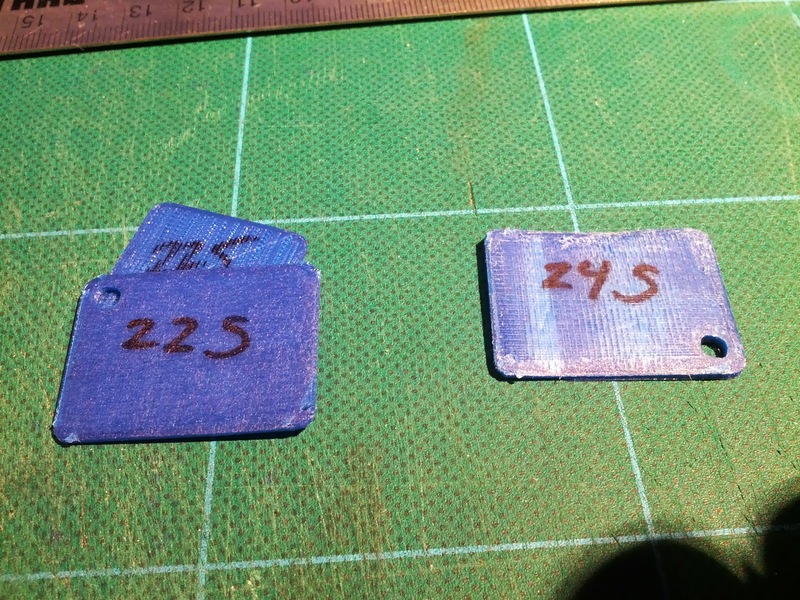 I ultimately found the sweet spot of 235c where the layers melded without de-lamination. This is a 300 micron print with default print head travel speeds, 90 extruding/150 travel. When printing you'll noticed that the trimmer line pop's and hisses alot, which is vapor trapped in the line and this results in when printing at higher resolutions, the filament will trap some of this and you'll have bubbles when printing, which in my case where the prints failed was when the printer head collided with the prints that were expanding upwards too fast because of the extra moisture. I could go about drying out the filament or using desiccants, but frankly its just not worth it. Like I mentioned before I'd use this "in a pinch" but 3d printer filament is fairly cheap and very easy to come by now. (unless you're getting them from overseas! but that's an article for another time!) If you have any questions about these test or have an idea on how to improve printing with trimmer line shoot me an email.